Sometimes commonly known as quantitative geomorphology, digital terrain modeling is thecomputer processing of raster grid arrays of elevation data. Using Geographic information system (GIS) technology we can further enable terrain-modeling results to be combined with non topographic spatial data creating several value added products. slope and aspect models, perspective scene generation, and drainage basin analysis (and other models). The physiogeographic characteristics of a surface can often be determined by elevation, slope, and its orientation, or aspect. 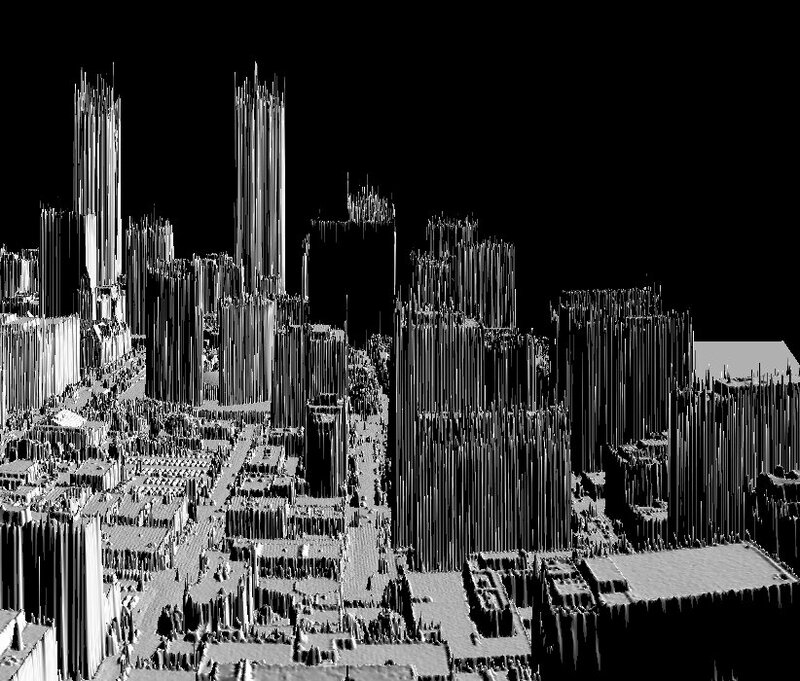 Together they can virtually define the surface plane completely, and provide valuable information for land use planning and other aspects of geomatics. (because most paper and computer screens are flat or two dimensional). In GIS applications it is often beneficial to add a texture component to the spatial data that will help the user get a feeling for the vertical depth of the data by emphasizing the elevation. To do this you need to create a shaded relief model from the DEM to model into the data. Shaded relief models use a defined light source at a fixed location it indicate terrain displacements using a shadow effect from evaluating the aspect and slope relative to the light’s azimuth angle and altitude achieved with varying grey scale tones resulting in the darkening of one side of terrain features, such as hills and ridges (the darker the shading, the steeper the slope). The shadow direction is affected by the light’s azimuth setting and shadow length is affected by the altitude component. The models provide subtle shadings which we naturally perceive as depth, helping to make the image look three dimensional. A drawback with this type of model is that depending on the placement of the illumination source, the eye and brain often see different things. 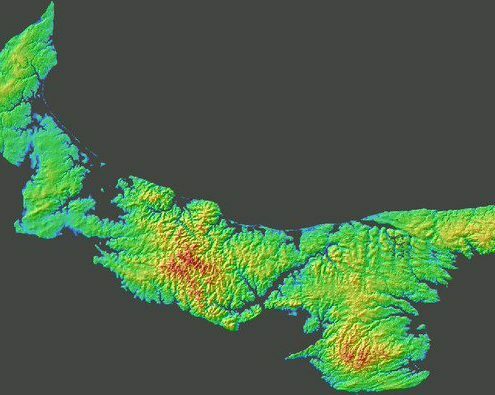 Adding color to the shaded relief images utilizes chromo stereoscopic techniques to help emphasize the depth of the Z dimension of the data. Color shaded relief models (CSR) are usually graded with a pseudo color ramp from cooler (darker) colors representing lower elevations to warmer (brighter) colors depicting greater elevations. 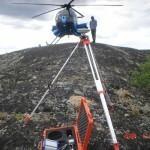 Most imagery and data that we view in geomatics is typically viewed vertical downwards toward the map or image. Occasionally it is useful to change that default traditional view because additional topographic information can often be revealed by observing the same elevation data obliquely (commonly known as a three dimensional perspective view). Data integration and overlays are very common with perspective views because it allows traditional flat images to become new products by incorporating an elevation component and providing a new look at the same data. It is also probably used more so for visual appeal then as another method of extracting data. The image above and to the left is a perspective view of a color shaded relief created from high resolution LIDAR using PCI Geomatica software. 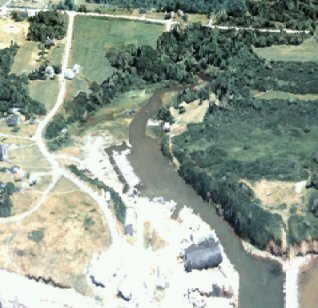 The oblique angle view point looking down at the image allows the observer to easily identify many of the data’s features such as trees, cars and buildings. The perspective scene in the image on the left is a representation of an urban terrain model including buildings and other various features. It was created using ESRI ArcScene software and high resolution LIDAR digital point data. The artificial oblique view allows the observer to obtain a unique glimpse from above looking down in a southerly direction towards City Hall of downtown Toronto, Ontario.